Pursuit Minerals Limited (ASX:PUR) today announced that it is adding a portfolio of high quality vanadium projects to its existing portfolio of assets. The company has secured multiple vanadium projects across Sweden and Finland that are at different stages of advancement, containing sites of significant historical vanadium mineralisation. They are in politically stable jurisdictions in areas of excellent infrastructure, with access to low cost power. Mineral Reservations have been secured over the Koitelainen and Karhujupukka Vanadium Projects in northern Finland. 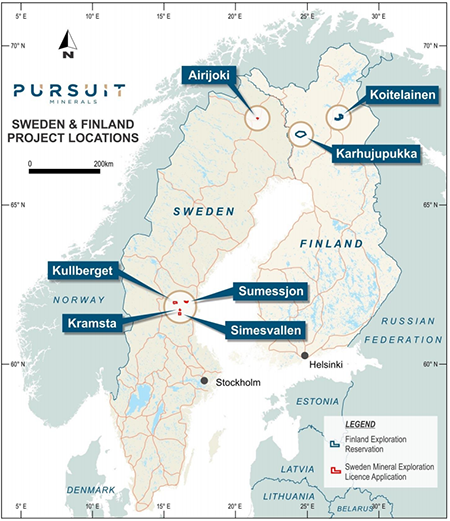 Mineral Exploration Licence applications have been submitted to cover the Sumåssjön, Kramsta, Simesvallen – Svedåsen and Kullberget - Storåsen Vanadium Projects in central Sweden and the Airijoki Vanadium Project in Sweden’s north. Importantly, PUR was able to submit its mineral tenement applications over open ground and hence the projects have been able to be secured in a very cost-effective manner. The Koitelainen and Karhujupukka projects in Finland contain major sites of historical vanadium and platinum group element (PGE) mineralisation, while the Kramsta Project contains a defined Exploration Target based upon historical drilling. The Koitelainen Project contains a historical Mineral Estimate of 70Mt at 0.4% vanadium (0.7% vanadium pentoxide (V2O5)), 14.4% chromium and 1.1g/t PGE for Koitelainen UC and 15Mt at 0.2% vanadium (0.4% V2O5) for Koitelainen vanadium. The Kramsta Project contains a historical Exploration Target estimate 10-12Mt at 0.1-0.25% vanadium, 3-5% titanium and 15-25% iron has been estimated. Rock samples taken from historical trial mining on the Simesvallen-Svedåsen Project, returned values of 0.4-0.5% vanadium (0.7-0.9% V2O5) and 11-13% titanium. PUR Managing Director Jeremy Read said that with the world moving to renewable energy, and several European countries looking to phase out internal combustion engine vehicles by 2040, vanadium-based batteries will have an increasingly important role to play in energy storage in the very near future. Read said, “With the localisation of the energy grid, due to increasing renewable energy production, and global transport fleets moving to electric vehicles, the world is requiring more vanadium due to its use in vanadium redox batteries. “Sweden was the country where vanadium was confirmed as a metal, and we have been able to secure high quality vanadium projects in both Sweden and Finland by submitting mineral tenement applications over open ground. “Finland and Sweden are excellent jurisdictions in which to undertake mineral exploration and project development, ranking first and 16th respectively on the 2017 Fraser Institute Survey. 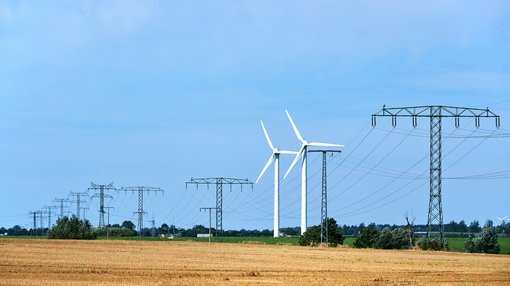 All of the projects are close to reliable low-cost grid power, sealed roads and rail infrastructure, while Ferrovan have announced plans to construct a vanadium production plant at Raahe in Finland. Work programs are currently being prepared for the northern hemisphere summer with the aim of preparing the projects for drilling during the next winter field season from November 2018 until April 2019.